Who is it for? 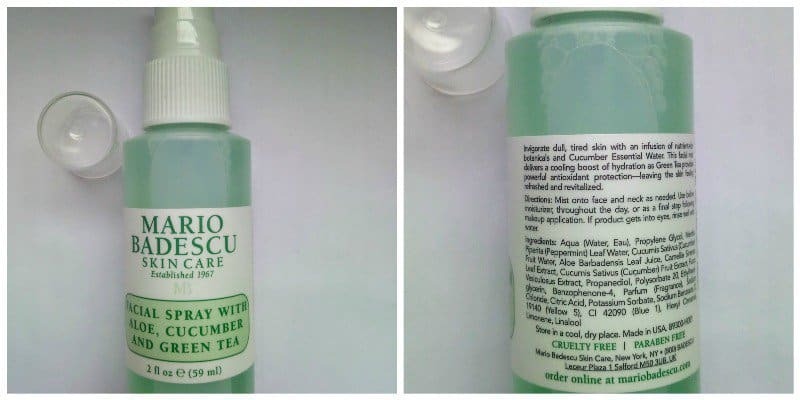 Mario Badescu Facial Spray with Aloe, Cucumber, and Green Tea is for the people who would want to invigorate their tired dull skin with an infusion of nutrient-rich botanicals and cucumber water. The facial spray comes in a plastic bottle which seems to be quite sturdy. It has all the necessary information pasted on it. The spray nozzle is of white color with a plastic lid over it for extra protection. The bottle is light weight and can be easily carried around in your purse. The consistency of this facial spray is just like a toner, nothing different about the consistency. It smells really good, it is a perfect concoction of the aloe, cucumber and green tea fragrance. It is not at all overpowering, it is very soothing just the way facial mists should be, refreshing! The facial spray is green in color, standing true to its three main ingredients. I love this product. It is really refreshing due to cucumber, aloe and green tea as its ingredients. It somehow also moisturizes the face and gives it a cooling effect. The presence of green tea acts as an anti-oxidant layer that helps to revitalize the skin. I personally really like to use it after my makeup is done so that all the excess powder gets settled into the skin and so that my make up doesn’t look cakey at all. Overall, it is a really nice facial spray for people with all kind of skin types. Would I recommend or repurchase the product? Yes, I would definitely repurchase this product and would also recommend it to others. It’s a good quality, a natural facial spray which can be used in multiple ways. I love the packaging and I feel that it is good to travel with. I especially love the combination of aloe, cucumber and green tea and it has certainly helped to upgrade the quality of my skin. Go ahead and try to get your hands on this product. It is worth a try!